IRVINE, Calif. – Faculty and staff from Chapman University’s College of Performing Arts, CSU Fullerton’s College of the Arts and UC Irvine’s Claire Trevor School of the Arts have joined forces to develop the Collaborative Arts Development Experience (CADE) – a program that provides cultural enrichment for lifelong learners and artistic development for emerging student artists and performers. CADE (cadeoc.org) was created to harness the collaborative power of three of Orange County’s premier institutions of higher education. The Program encourages learning by doing outside a traditional academic setting and helps young artists find their artistic voice through practical training, experiential learning and industry immersion. This first two-week session takes you to London during Shakespeare’s 400 to immerse you in the West End theatre scene. You gain access to backstage tours and talk-backs, work with the UK’s best actor training programs and experience the arts and culture that have made London a cultural hub for centuries. The fun and excitement of London are at your fingertips as we turn the city’s theatre scene inside out for you, opening its backstage doors and giving you access that you can only get with CADE-London. Attend six West End plays or musicals, train at Shakespeare’s Globe, learn British dialects and acting through song and hear from the actors, stage managers and agents working in the industry, among other exciting opportunities to be immersed in London’s arts and culture scene. Guiding the CADE program are three professors, one from each university. “There is no greater education than travel: interacting with others, seeing different places, and experiencing new things. It changes your view of the world. Personal and artistic growth and maturity comes from events like this,” says Mitch Hanlon, Professor of Music Theatre at CSU Fullerton. Don Hill, Professor of Stage Management at UC Irvine states, "The greatest growth experience of my entire college career was doing the travel abroad program to London. It is truly one of the greatest cities of the world, with a limitless amount of cultural activities to explore. The CADE program is designed specifically to give every student a personal, behind the scenes, once in a lifetime educational journey." To be considered for enrollment in CADE-London’s workshops, you must be either a recent graduate or currently enrolled arts student interested in extending your training beyond the university classroom. 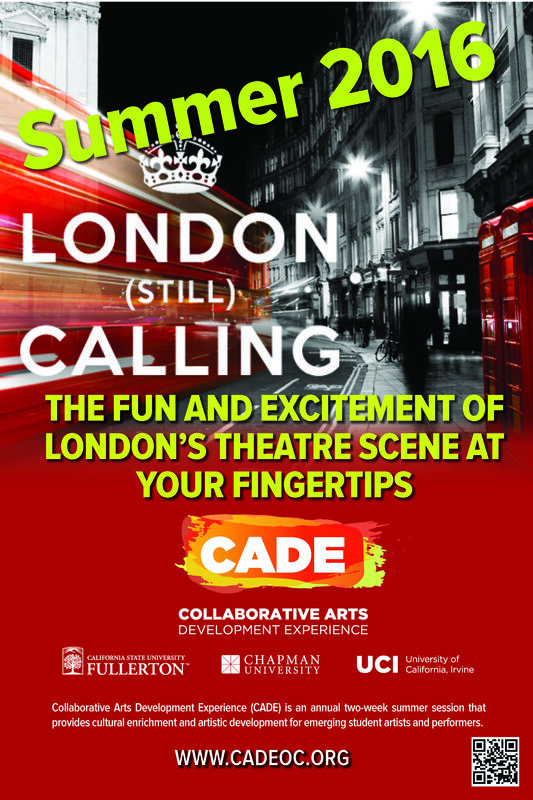 CADE-London is open to observers, our lifelong learners, who are interested in experiencing the art and culture of London’s West End and viewing performances, but not actually participating in workshops. Included in the experience are flights, housing, transportation in London, select meals, tickets to shows and one-of-a-kind interactions with industry professionals.